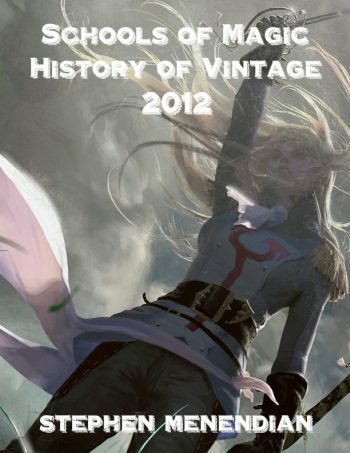 For a format marketed as “Eternal,” each year in the History of Vintage delivers unexpected twists and turns in the direction of the metagame and the evolution of the card pool. Nonetheless, certain fundamental axioms are observed over time. Occasionally, these perdurable verities are controverted, as when manaless Dredge proved a deck could not only win without playing spells, but was optimized without Moxen. 2012 taught that even the most unshakeable truths and foundational assumptions are open to question, if not doubt. Since the printing of Onslaught fetchlands, the Vintage format revolved around Yawgmoth’s Will more than any other restricted card. Yawgmoth’s Will may not have been the most played restricted card, but it was the card that seemed to have the most strategic significance. It did not stretch the imagination to conceptually map the Vintage metagame in to Yawgmoth’s Will and anti-Will strategies. Cards like Grim Tutor and Gifts Ungiven were largely intermediate steps towards achieving a critical mass, game-winning Yawgmoth’s Will. The GushBond engine was but a swirling mass of card celerity around Yawgmoth’s Will. With the virtually simultaneous re-errata of Time Vault, and the printing of Tezzeret the Seeker in 2009, Time Vault joined, Tinker and Yawgmoth’s Will in a troika of strategically omnipresent restricted cards that, despite their restriction, seemed to dominate the format. Time Vault control decks buttressed by Tinker and Yawgmoth’s Will won the 2009 and 2010 Vintage Championship, and ended up in second place in 2011, with Dredge claiming its first title. Although Lodestone Golem dramatically strengthened the hand of the O’Brien School since Worldwake in 2010, counter-tactics and strategic innovations largely occurring in 2011 thawed a frozen metagame, and Workshops receded somewhat from a position of frightful dominance. Turbo Tezzeret strategies blitzed past the Lodestone assault, and Ancient Grudge hit the mark against top-heavy Workshop decks. Yet, the wax and wane of strategic archetypes seem to occur on a parallel course with deeper, underlying dynamics, such as the seemingly unerring quest to abuse Yawgmoth’s Will. It was an axiom of Vintage play that virtually all that decks that could employ it, should. The strategic carapace and tactical camouflage might change, but Yawgmoth’s Will was a driving force beneath the format. With a few critical printings nudging the format in a different direction, 2012 was a pivot on the course to a more modern form of Vintage. It was a bridge out of the era of Yawgmoth’s Will, big blue decks, and towards greater homogeneity, “fair” decks, and reduced reliance and focus on the Vintage Restricted List.